This amazing (and rather pretty) Google Maps mashup can tell you how long it takes to get anywhere in New York from anywhere else in the city. Using the map is very, very easy, you just enter your address and press the 'map it' button. The map then adds an overlay that is colour-coded to show the time it takes to get anywhere else. There is even an option to compare two different addresses. Enter two different addresses and two maps are shown side by side. The estimations on the travelling times comes from station-to-station commute time data from the Metropolitan Transit Authority, and walking calculations are via Manhattan Distance at 3mph. 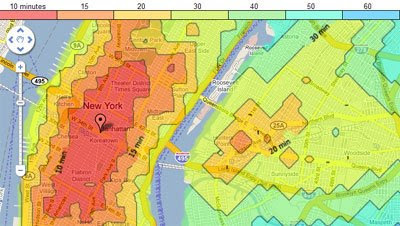 Triptop NYC is similar in concept to Where-Can-I-Live, which displays London properties on a map based on commute times. I think there is a huge potential here for Triptop to be mashed up not only with real estate data but with data about nearby bars and restaurants. Just adding the GoogleBar control to this map would allow users to quickly view bars and restaurants within ten minutes of any location (and allow the developer to earn a little income from the new targetted advertising in the GoogleBar control results). The GoogleBar would be hella useful - consider it added! Very impressive and exceptionally creative. But seems buggy. Did not recognize my address in Queens and showed my area on the map as 120 min from the Village - even though the nearest subway stop is 5 miles away and Triptrop does not take buses into account (yet). And whats up with that sliver of Staten Island. There is no walking across the bridge.